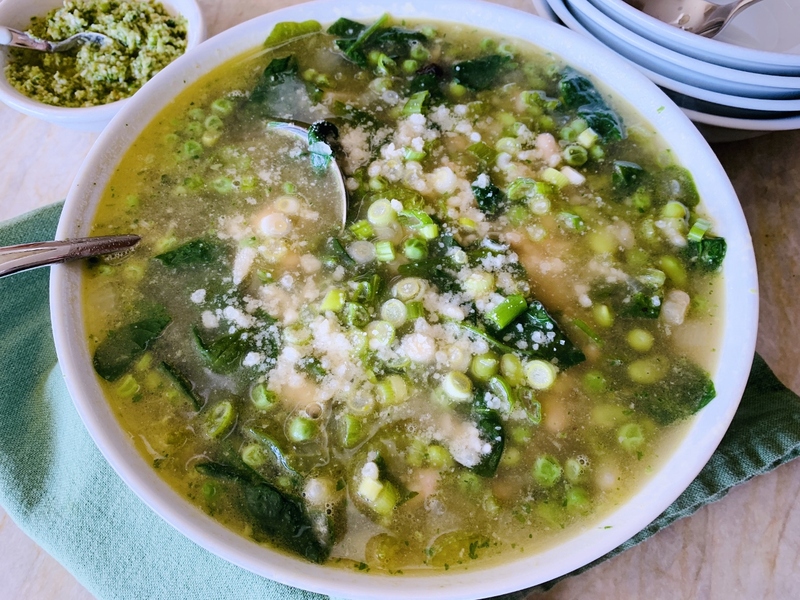 Green Minestrone with Spring Onion & Parsley Pesto - Recipe! - Live. Love. Laugh. Food. Spring officially begins tomorrow and what better way to bring in the new season than with a bowl of vegetable based soup. 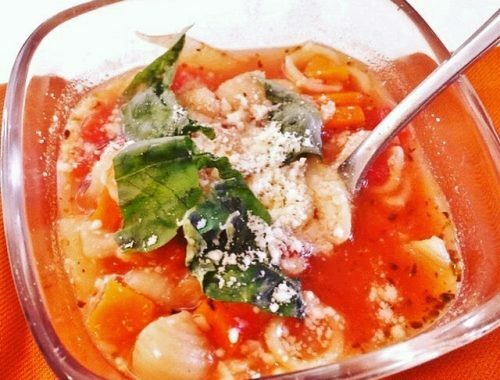 Traditionally minestrone is reddish in hue, but during the brighter months of the year, it’s fun to take that same vegetable based recipe and turn it green. 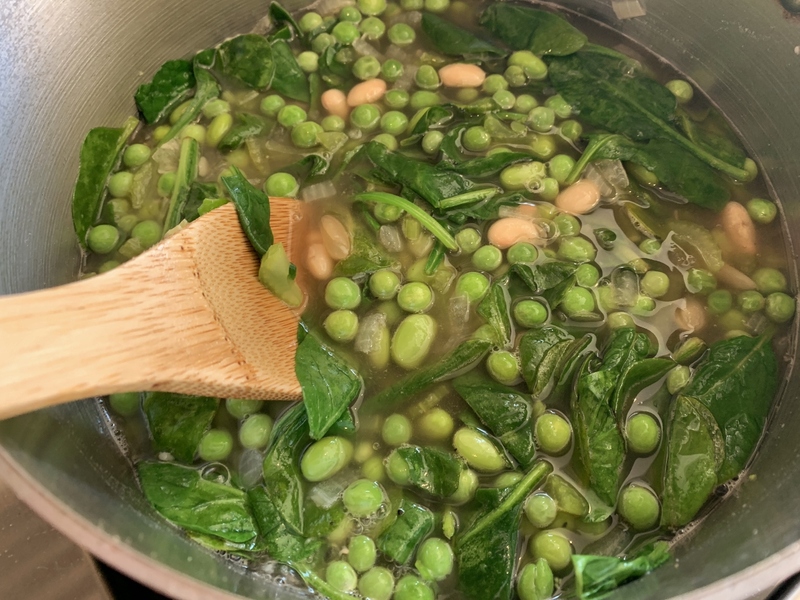 Sweet peas, edamame, spring onions and fresh spinach are abundant during this season, and it’s time to take advantage of their clean flavors and turn them into something wonderfully warm to eat. Minestrone begins with onions and celery, and with the addition of a few green friends, it creates an entirely different soup. White beans round out the unicolor vegetables, and instead of pasta, I kept it pretty clean and added spinach instead. 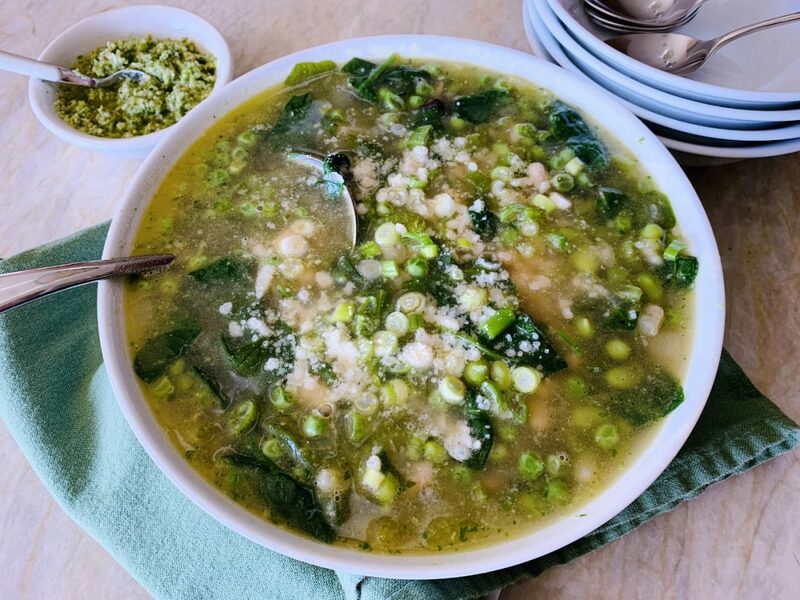 Pesto can be made with any type of herbs, and I found spring onions and parsley to be the perfect match for this Green Minestrone. 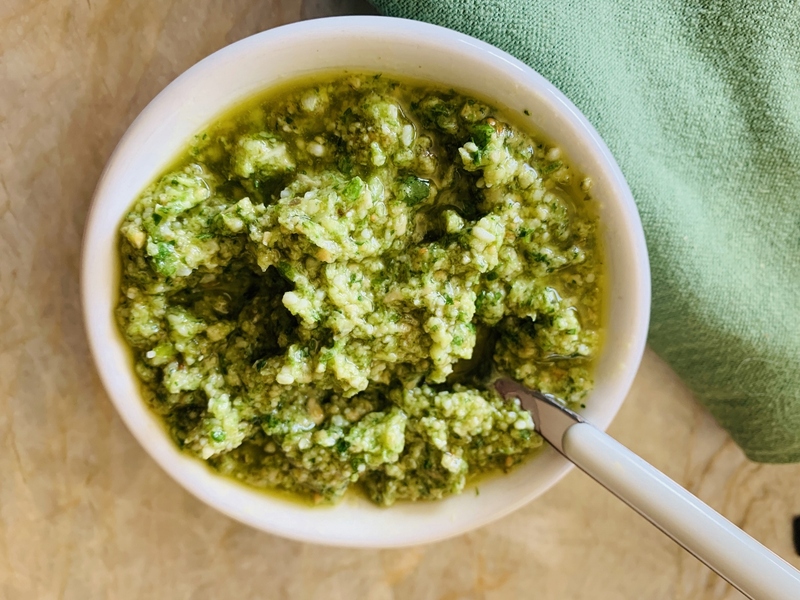 The pesto is used in two ways in this recipe, stirred into the soup to add depth of flavor and give it a slightly thicker consistency, and to dollop on the top of each bowl for an amazing finish. 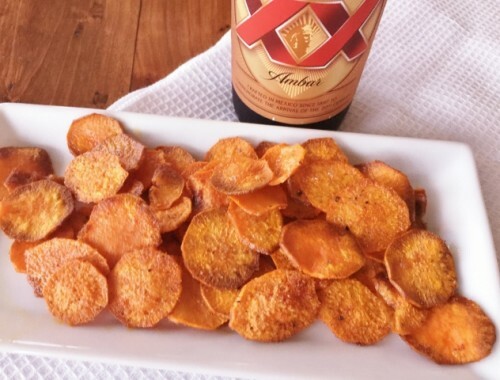 This recipe is easily made within 30 minutes, and the leftovers are great for lunch. It reheats beautifully in the microwave and can be packed up and toted along to any daytime function in a thermos to enjoy. In a large saucepan, add 2 teaspoons olive oil and place over medium heat. Add onion and celery and stir. Saute for 4 minutes until vegetables are translucent. Add peas and edamame, cook for 5 minutes, stirring occasionally. Pour in broth and stir. Cook into almost boiling and add beans and spinach leaves, stir until combined. Turn heat to simmer and place lid a jar over top. 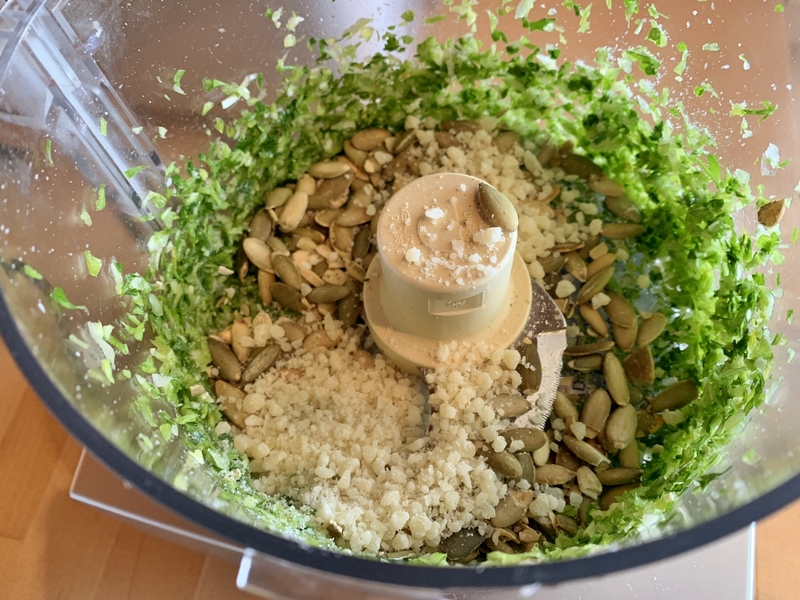 While soup is simmering make pesto – place spring onions and parsley in food processor, pulse until coarsely chopped. Add pumpkin seeds, Parmesan, salt & pepper – pulse again for 30 seconds. While processor is running, drizzle in olive oil until mixture just begins to come together. Remove and place in a bowl for serving. Spoon 1/4 cup of pesto into soup and stir. Ladle soup into bowls and top with additional Parmesan cheese and scallions. Serve pesto with soup to dollop on top. Enjoy! 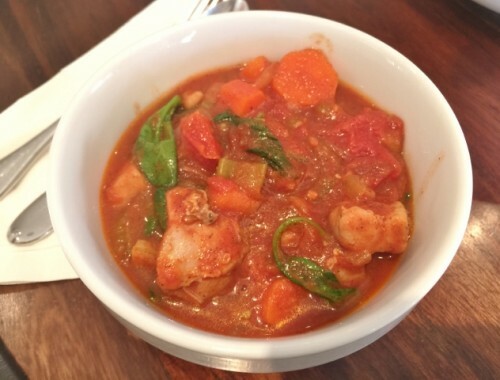 Easy Chicken Vegetable Chili (No Beans) – Recipe!